We are one of the prominent names in the industry, offering Fire Fighting Equipment Signs. As an affluent enterprise of this domain, we are emerged in providing premium quality array of Fire Exit LED Signage Board. As Fire Exit Sign plays an important role in the case of emergency, so we are designing them in bold and eye catchy look to attract the attention instantly. Energy-saving combination LED exit sign and emergency lighting unit in one compact, modern design. Flexibility and multi-function capabilities include LED performance on both the exit sign and the lamp heads. Spanish “Salida faceplate also available (Part numbers: FHE30SFG= Green lettering, FHE30SFR= Red lettering). 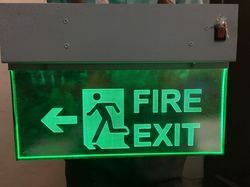 Edge-lit Fire Exit Signs are mandatory for office and commercial buildings to clearly show the way to exit in emergency we provide unique designs and special discounts for bulk orders uniform dimensions will be 15"x6"x6mmx50mm with LEDs or night glow radium. We are one of the most distinguished providers of Exit Sign Photo-luminescent that are widely used for framing and permanent mounting to the wall without the usage of any visible fastening devices. These injection moulded polypropylene are extremely light in weight and incorporate a 3 / 16 glow back plate with 1 / 8"
We offer high quality external building signages. These sign boards can be availed in different designs and sizes as per the specific requirements of our clients. Owing to their long service life and clear visibility, these signages are widely utilized for several advertising and marketing purposes. Special application EXIT Light in black body in all Auditorium EXIT Light for Cinema Theaters. Also available in three level of safety. Mains operated. battery operated. and photoluminescent modes. 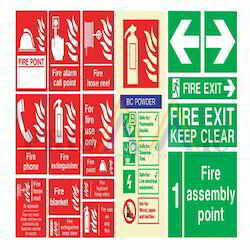 In order to cater to the numerous necessities of the patrons, we have been able to provide a wide range of Fire Signs.